Are you trying to loose weight by avoiding sugary drinks and increase water intake? Have you ever wanted to drink plenty of water but just couldn't do it? Do you find that water is too boring, or just doesn't taste right? The key difference is the size of the bottle and the design of the cap. 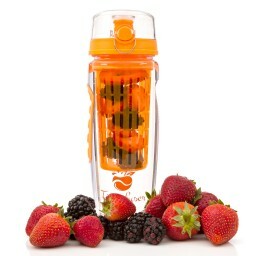 It is a dual opening cap -- one twist opened, large opening that make it easy to put ice and fruits; the other opening is a drinking spout that open and close easily -- very convenient to use during workout when you have limited time to take a sip. You will find several sellers selling bottles with similar design (because it is a good design). 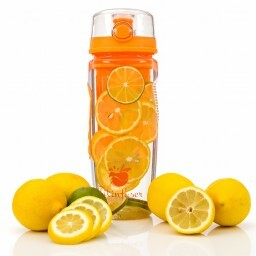 You may like our bottle better because of the trendy orange color.